This Klasse how-to guide was written after using and testing Klasse products in every imaginable combination and with a huge selection of polishes, applicators, towels, buffing pads, bonnets, drying towels and more. Here are personal notes about what works with Klasse and what does not. These recommendations come from experience and will help make your Klasse experience better. WHAT IS KLASSE CAR WAX? Klasse is a synthetic wax (sealant) and the original two-step paint care system. The first formulation was released in 1969. It was a breakthrough admixing polyethylene carnauba wax replacement system. Through the years, Klasse car wax has evolved with many improvements. The first major change came in 1986, when Klasse was modified from its original formula to use the latest polyethylene-acry compound technology. Between 1991 and 1996, the chemists made incremental improvements to improve durability by more than 30% and U.V. protection by 100%. There are two products in the Klasse system. Klasse All-In-One is a combination cleaner and sealant in one, whereas Klasse Sealant Glaze is a pure sealant (no cleaning or polishing properties). Klasse All-In-One is intended to be used as a seasonal cleaner-wax, and as a pre-step to using Klasse Sealant Glaze. If your paint is in new or like-new condition, Klasse All-In-One will help you keep it that way. Klasse Sealant Glaze provides additional sealant protection and a deeper, high gloss finish. As a pure sealant, multiple coats of Klasse Sealant Glaze can be applied to improve the final finish. The first step in any car detailing program is a thorough washing. Wash your car with a double strength mixture of Wolfgang Auto Bathe and dry with a Cobra Supreme Guzzler Waffle Weave Drying Towel. After a thorough washing, inspect your paint for contamination, scratches, swirl marks and other defects. If you find these paint problems, now is the time to correct them. If you wash regularly and garage your car, applying Klasse All-In-One (AIO) twice a year is normally sufficient to maintain good paint health. Klasse AIO's cleaning ability is mostly chemical, not abrasive. 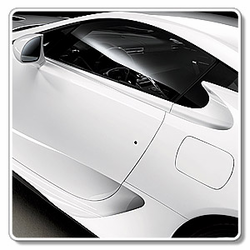 The polishing ability of Klasse AIO is very slight, but it will remove fine swirl marks, stains and moderate oxidation. Rather than rub your arm off trying to clean your paint perfectly with Klasse AIO, it's a good idea to start with detailing clay. Detailing clay will safely and effectively remove all surface contamination with ease. 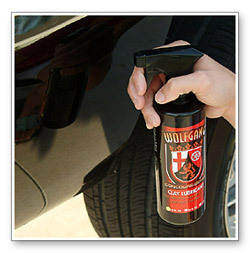 Use the Wolfgang Clay Combo to remove embedded contaminants from your car's finish. Detailing clay quickly and easily removes surface contamination. Heavy rubbing is never required. Use plenty of Wolfgang Clay Lubricant Spray and rub the clay lightly over the paint finish. After your paint has been cleaned you are ready to polish with Klasse All-In-One! Wolfgang Instant Detail Spritz works great to maintain the finish left behind by Klasse products. Use it between washes to remove light dust, finger prints bugs and other light contamination. Use it after washing to remove water spots and restore gloss. For best results, use Wolfgang Instant Detail Spritz with the Gold Plush Jr. Microfiber Towel. This is a high quality microfiber detailing towels with a thick, plush nap. A plush nap will help protect your paint when removing dust and other contamination. Do you want the secret to keeping your Klasse finish looking like it was just applied? It's Wolfgang Deep Gloss Spritz Sealant! Wolfgang Deep Gloss Spritz Sealant, is a polymer sealant in spray form - simply spray, wipe and walk away! You can treat your car after every wash in less than five minutes. Your paint will emerge looking like you applied a fresh coat of Klasse Sealant Glaze, and full protection will be restored. Using Wolfgang Deep Gloss Spritz Sealant bi-weekly, I have been able to extend my Klasse car wax shine and protection up to a full year. Of course, your experience will differ depending on diving and garage conditions. Wash to remove dirt and road grime. Clay to remove bonded contamination. Polish with Klasse All-In-One to restore full paint gloss. Seal with one or two coats of Klasse Sealant Glaze to protect. Maintain the high gloss with Wolfgang Deep Gloss Spritz Sealant. Hopefully this Klasse car wax and Klasse car sealant user's guide has been beneficial. If you have any questions about using Klasse AIO, Klasse sealant glaze, or other Klasse car wax products, please send us an email.